Fruit smoothies are a fun way of having different types of fruits for breakfast. 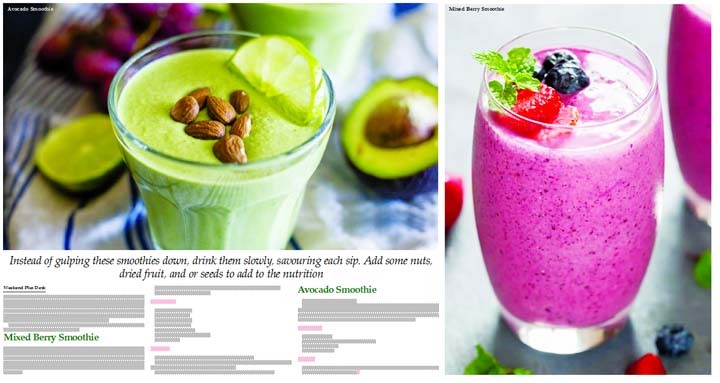 Depending on the season you can create delicious combinations of breakfast smoothies. They are also great for taking on-the-go if you are in a hurry and donâ€™t have time to actually eat the different fruits. But just as you need to chew the fruits and take every other bite after some time, do the same with smoothies, instead of gulping them down, drink them slowly, savouring each sip.